Is Justin Trudeau’s Political Career In A Death Spiral? According to a recently released Ipsos poll Justin Trudeau’s government is on track for a historically embarrassing defeat in October of 2019. Only once in our Canadian history has a party replaced a long-standing government with a majority mandate, only to lose power altogether in the succeeding election. Justin looks likely to repeat that fate. In the 2015 election, the Conservative Party of Canada ran a contrast ad that stated Justin just wasn’t ready to be prime minister. Unfortunately for Canadians, it turns out that the Conservative’s ad was dead on point. Justin wasn’t ready to be prime minister. To be fair, the ad was also correct in pointing out that Justin has nice hair. Quickly Attained A Tipping Point. The incredible amount of political baggage the Liberal government has accumulated in a mere 30 months in office is astonishing. The Trudeau family vacation in India may well be recorded by historians as the tipping point leading to the end of Trudeau’s political career. For example, Trudeau and his family appeared repeatedly in traditional Indian clothing to the point where it offended his hosts. Justin embarrassingly did a Bhangra dance which was far beneath the dignity of a visiting head of government. Trudeau may have also invited Jaspal Atwal, an Indo-Canadian and Liberal Party of Canada activist who had also tried to kill an Indian cabinet minister, to a dinner, while in India. The word “may” is appropriate because there are conflicting stories about who exactly issued the invite to Atwal. The Liberal’s attempts to blame the invitation on the Indian government is laughable given Atwal’s criminal record in India. The terrible India trip was followed by a budget that only serves to alienate half of Canadians. Trudeau has been unwavering in his goal to be a feminist prime minister. His flippant comment that he appointed a gender-balanced cabinet because it was 2015 highlights the problem when identity politics are paramount over qualifications. The budget added to his supposed “street credibility” on the feminist front, again to the detriment of men. After respectfully listening and judging Justin’s actions as a feminist prime minister Canadian men have finally had enough. Shortly after Trudeau was elected 44% of men indicated they would vote for him. That is a reasonable level of support for a newly elected prime minister with a majority government and indicates that Canadian men were willing to give a feminist prime minister a chance. After 30 months of childish government driven by identity politics, that level of support has shrunk to about 30 percent. There appears to be no positive way forward for Trudeau as his record of accomplishments to date is horrible. He has been a disaster on the fiscal front, as he has no plans to balance our rapidly expanding deficit, and is losing support on the cultural side due to his use of identity politics. Re: Is Justin Trudeau’s Political Career In A Death Spiral? Last edited by ferri on Apr 2nd, 2018, 9:07 am, edited 1 time in total. 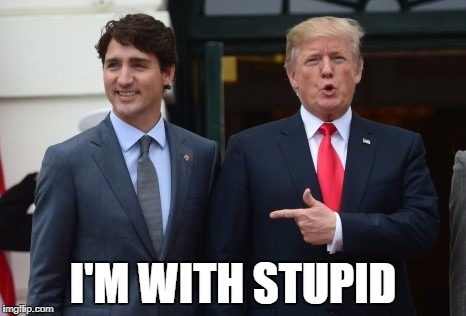 What man ever support a Trudeau. 44 percent lol. Ya rite. 4 percent maybe. Gone_Fishin wrote: Is Justin Trudeau’s Political Career In A Death Spiral? ^^^ bloodshot eyes, you wonder what JT is on. I think the new political slogan should be "He will never be ready". This government is a joke, and has been one from day one. I am just glad all of the brain-washed sheep are finally waking up from their hypnosis and can see that the emperor has no clothes. The next election is a ways off yet. Just because a vocal minority and Russian bots are working overtime on their propaganda campaign does not mean Canadians aren't capable of policy discussions and forming informed opinions. Saying he has nice hair, is too focused on gender policy, takes too many vacations and wears costumes won't win elections in Canada. You need substance and a viable alternative. Because if that's all you have to b*tch about we're doing pretty good. JLives wrote: The next election is a ways off yet. Just because a vocal minority and Russian bots are working overtime on their propaganda campaign does not mean Canadians aren't capable of policy discussions and forming informed opinions. Saying he has nice hair, is too focused on gender policy, takes too many vacations and wears costumes won't win elections in Canada. You need substance and a viable alternative. Because if that's all you have to b*tch about we're doing pretty good. And when he legalizes pot, you'll forget all about his hair. I think all the intelligent voters in Canada, are completely fed up with this air head embarrassing all Canadians. He was never ready, and never will be. Time to vote for someone who won't bankrupt the country. This is why you're going to lose again. Maybe 8 people voted for him because of legalizing pot. It was only an issue for Conservatives. You're pulling a Hillary Clinton by calling the voters dumb. How did that work out? Last edited by ferri on Apr 2nd, 2018, 9:15 am, edited 1 time in total. JLives wrote: Just because a vocal minority and Russian bots are working overtime on their propaganda campaign . Those same Russian bots got Mr. Nice Hair elected in the first place. The Liberals can do what the Socreds did in BC for decades, be wildly unpopular for 3/4 of their term and then throw lots of money at the end to keep their reign. I used to wonder if the BC voters could be that naive and stupid term after term but apparently the Socredes had the winning formula. I would expect the Liberals to employ the same tactic for the upcoming election and get in again. JLives wrote: Saying he has nice hair, is too focused on gender policy, takes too many vacations and wears costumes won't win elections in Canada. You need substance and a viable alternative.